The Solu Comp Model Xmt family of transmitters can be used to measure pH, ORP, conductivity (using either contacting or toroidal sensors), resistivity, oxygen (ppm and ppb level), free chlorine, total chlorine, monochloramine and ozone in a variety of process liquids. 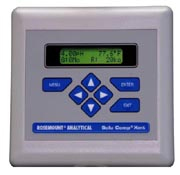 The Solu Comp Model Xmt family of transmitters can be used to measure pH, ORP, conductivity (using either contacting or toroidal sensors), resistivity, oxygen (ppm and ppb level), free chlorine, total chlorine, monochloramine and ozone in a variety of process liquids. The Xmt is compatible with most Rosemount sensors. See the Specification sections for details. The transmitter has a rugged, weatherproof, corrosionresistant enclosure (NEMA 4X and IP65). The panel mount version fits standard ½ DIN panel cutouts, and its shallow depth is ideally suited for easy mounting in cabinet-type enclosures. A panel mount gasket is included to maintain the weather rating of the panel. Surface/pipe mount enclosure includes self-tapping screws for surface mounting. A pipe mounting accessory kit is available for mounting to a 2-inch pipe. The transmitter has a two-line 16-character display. Menu screens for calibrating and registering choices are simple and intuitive. Plain language prompts guide the user through the procedures. There are no service codes to enter before gaining access to menus. The Model Xmt includes the HART digital communications protocol. Digital communications allows access to AMS (Asset Management Solutions). AMS can be used to set up and configure the transmitter, read process variables, and troubleshoot problems from a personal computer or host anywhere in the plant. The seven-button membrane-type keypad allows local programming and calibrating of the transmitter. The HART Model 375 communicator can also be used for programming and calibrating the transmitter.